Hiya guys! Oh gosh, it's Wednesday already. Time is flying by and I don't like that one bit. That means I'd better step my game up cause I'm falling behind again. So much swatching so little time, haha. 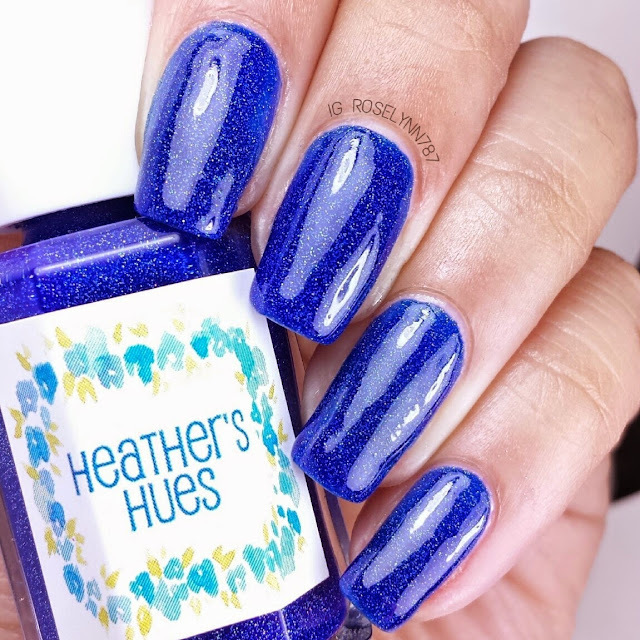 Today I have another new indie to show all of you, Heather's Hues. First off, holy moly is the name just immensely cute or what. I love it, very unique and memorable. Heather's Hues, based in North Carolina, are all 5-free polishes so you guys don't have to worry there. 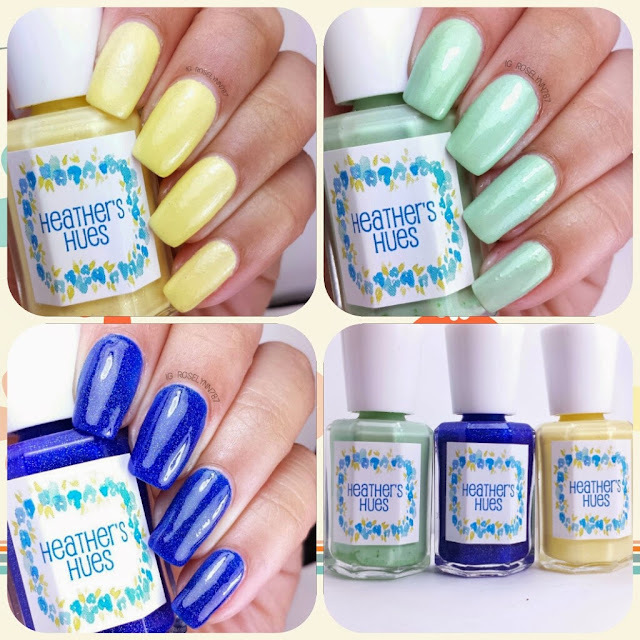 She has three collections up on her store and in this review I'll be reviewing three polishes from her On The Way To Cape May Collection. 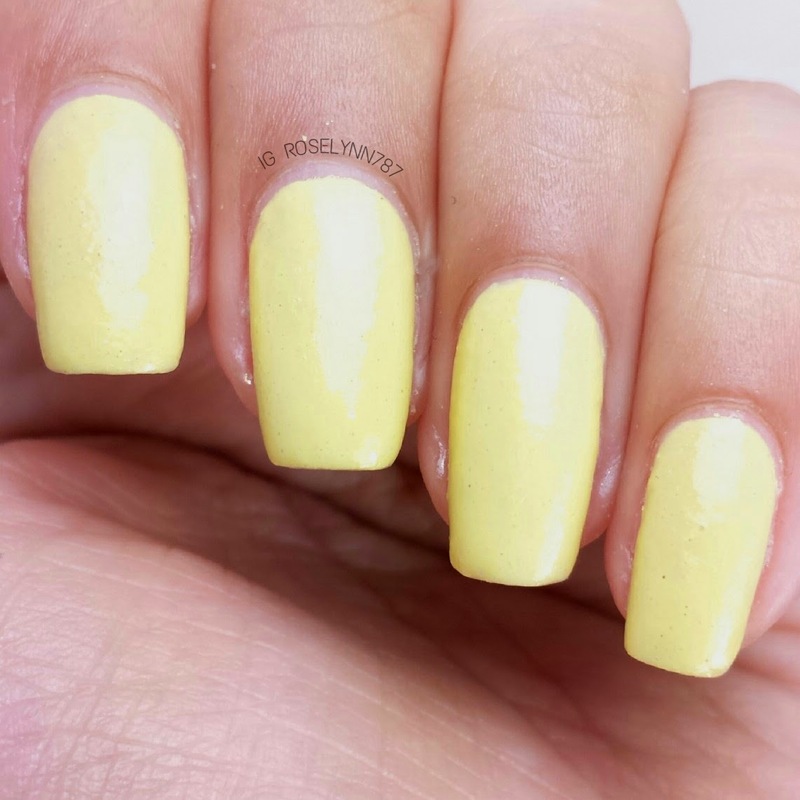 Sunkissed is a vibrant yellow cream polish with gold micro glitters. I love how this yellow doesn't clash with my skin tone whatsoever. Big plus in my book there. 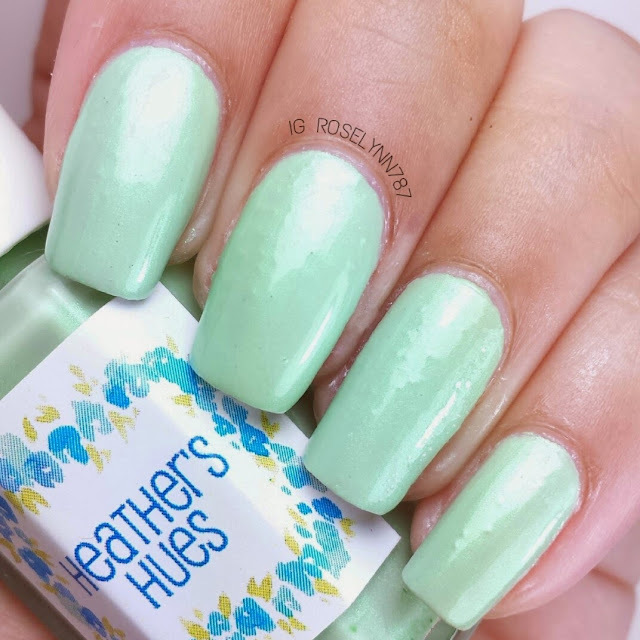 It's the perfect pleasant shade for spring and even summer. Soft but definitely eye-catching. Swatched over a clear base, used 2 very thin coats, and sealed with a fast-drying topcoat. Although I did enjoy the color, I had a bit of a problem with the formula. It was thick and a little hard to work with after one thin coat. I had to use a bit of thinner to accomplish the swatches you see here. However, don't be discouraged. I spoke with Heather (who is a complete sweetheart btw), she explained there was a mix up with the base and she has actually has switched base supplier altogether. Don't you love it when indie makers are on their game like that? A+ for customer satisfaction. 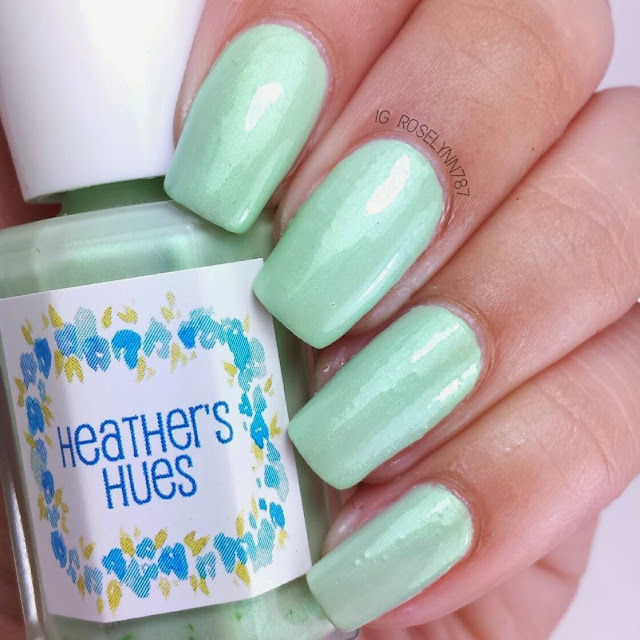 Beach Grass is a beautiful color shifting pastel green with a shimmer undertone. You guys know I'm sometimes hesitate when it comes to shimmers but Heather has manage to pleasantly surprise me with this one. 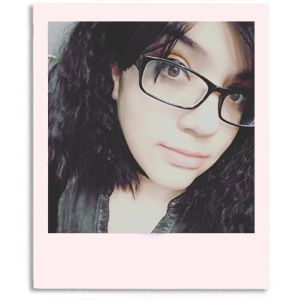 Again, another light color that I would normally not pick but looks great with my complexion. 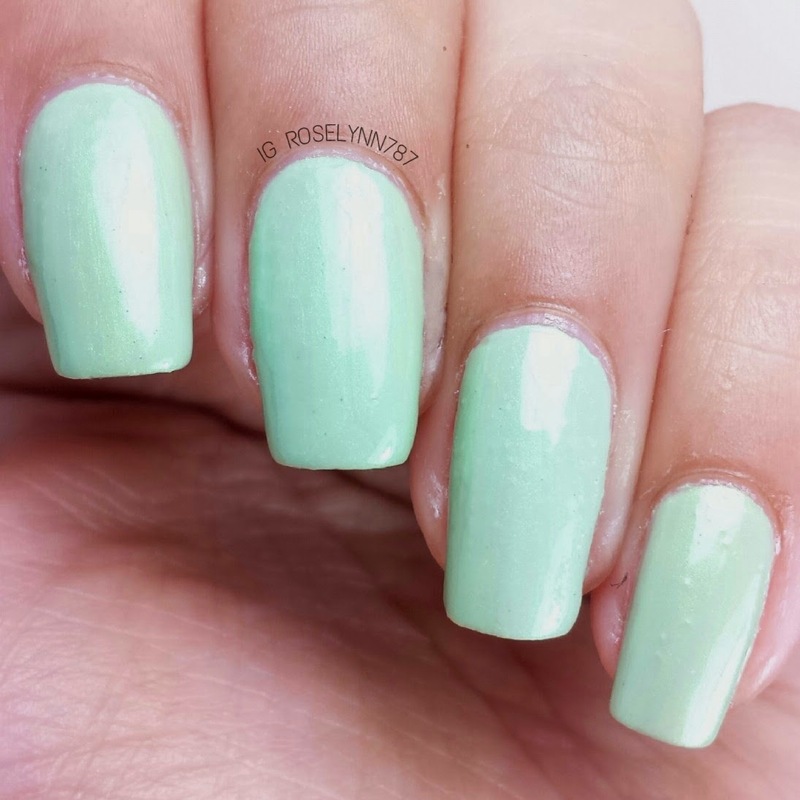 The soft pastel is perfect for spring or for elegant occasions, like Prom! Swatched over a clear base, used two thin coats, and sealed with a fast drying topcoat. This formula gave me no trouble whatsoever. You do have to be careful of your brush strokes like you do with all shimmers. But two coats and I got full opacity and looked fantastic. The color shift adds a really nice overall touch. 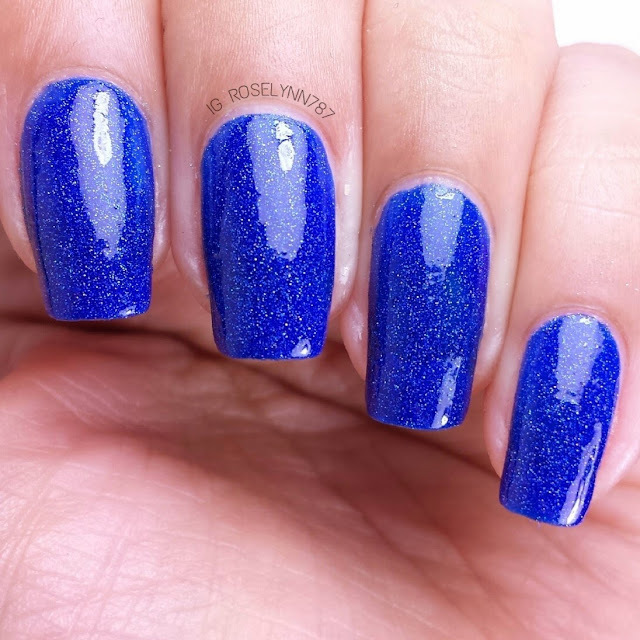 Pier-fect Blue is a bright blue jelly polish with a scattered holo to it. So this would be the one that has me jumping up and down and all around! With these photos, you shouldn't even be asking why. It's so bright and electrifying! Hands down my favorite. Swatched over a clear base, used three thin coats, and sealed with a fast drying topcoat. Even though it's a jelly, I didn't feel the need to use an undie. I did make sure to let each layer dry before applying the one there-after to avoid buildup. Formula wise, this beauty was excellent. Very smooth and easy to work with. 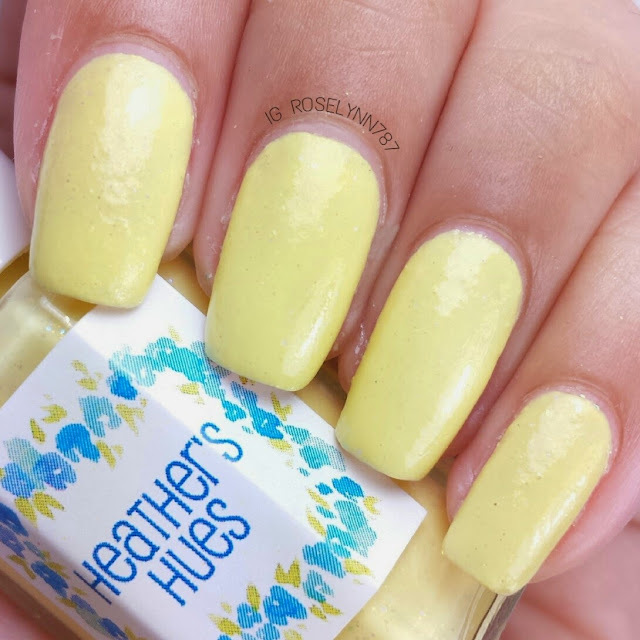 Overall I'm happy with my experience with Heather's Hues. I love the name so much! It rolls off the tongue so well, haha. And don't even get me started on the bottles, very unique. But all that aside, these polishes are really pleasant and eye-catching. These bottles retail for about $8.50 each and will actually be retiring really soon. Don't miss out! It's unfortunate about my experience with Sunkissed but I did not have that trouble with the other two at all. 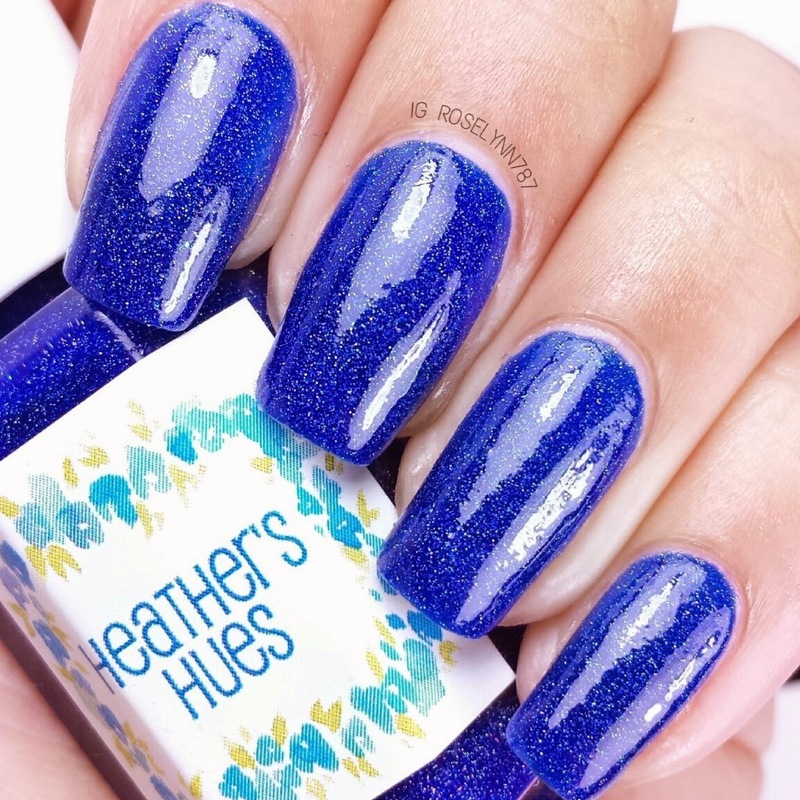 Pier-fect Blue is absolutely amazing and a must-have for any collection. For one of the newer indie faces out there, she has definitely won me over and I look forward to seeing her newest creations. Now off to the swatching table to bring you guys more beauties to go ga-ga over! 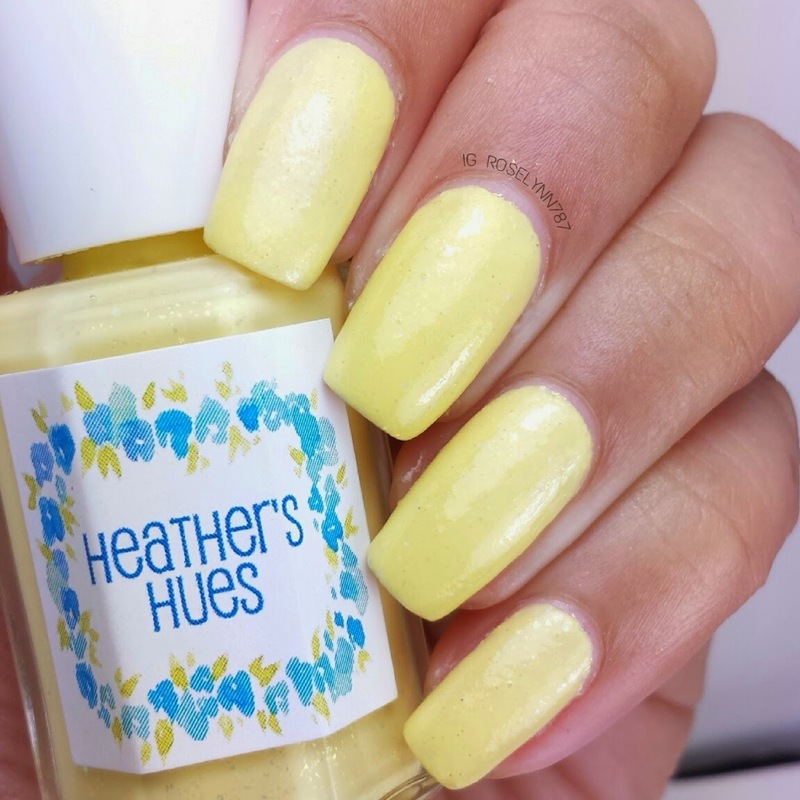 That yellow color is the perfect spring color! These are so pretty. I'm a sucker for blue polish and this one is amazing. Thank you so much for sharing. These colors are cute for spring! Perfect collection for the season! OMGSH I love that yellow!! And the mint!!!!! Pastels are my FAVE for the springtime!! Newest follower here :) found you on the link up! !